John Deere, a renowned marine diesel engine manufacturer has built more than five-million engines. Started in 1918, the company built its first diesel in 1949. These days it manufactures engines from 49 to 600 horsepower. 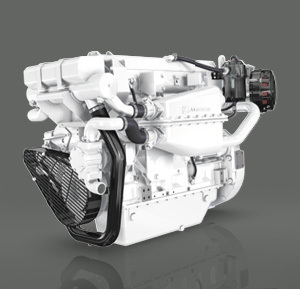 Its PowerTech line of marine engines include 4.5-Liter, 6.8-Liter, 8.1-Liter and 12.5-Liter marine diesels. True to the times they are electronically-controlled and self-diagnostic. Key features of the John Deere marine diesel motors include low-friction piston rings that lend enviable fuel economy, a water cooled exhaust manifold that keeps the engine cooler and quieter. One of the most valued features are the internal coolant passages that eliminate hoses and fittings that might otherwise fail. Rebuilds are made infinitely easier by the replaceable wet cylinder liners and replaceable valve seats. Both naturally aspirated and turbocharged models are available.